Important Information about certification requirements for working at a pool in Montgomery County, Maryland. * Be at least 15 years old. * Swim 300 yards continuously, using freestyle and breaststroke. * Surface dive and retrieve a 10lb brick from at least 8ft deep. * Tread water for 2 minutes without using your arms or hands. When you pass the course you will be certified in Lifeguarding and First Aid for 2 years and Professional CPR for 1 year. All 3 phases must be completed in consecutive days with passing scores to recieve your certification. 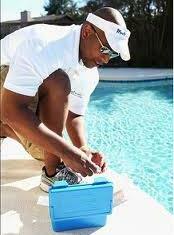 ​The course is required prior to taking the County test for the Pool Operator's License.